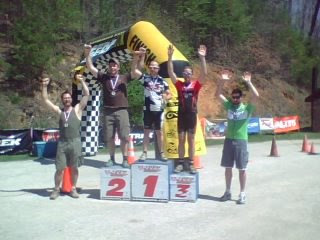 Saturday turned out to be a great day for racing. Expected high temps were masked by an overcast sky and a nice breeze. Chris and his small posse of volunteers got the event set-up and things ready to roll just as the mass of athletes started to arrive. 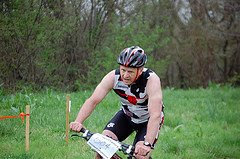 There were two races today; the God's Country Duathlon and the God's Country Mountain Bike Race. 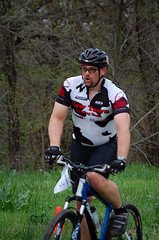 Both events were held at the Lawrence River Trails in Lawrence, Kansas. The trails were in perfect condition and the course was super fast. The weather held out for both events allowing for a great day outdoors. For the Duathlon it was a mass start on the gravel levee. This allowed space to be made and the fastest were in the front as they entered the single track dirt loop. After the run part of the race participants grabbed their bikes and headed back out for another lap of the trail. The leaders were way ahead of the remaining racers. Everyone seemed to be having a great time as they ran or peddled past the start/finish. 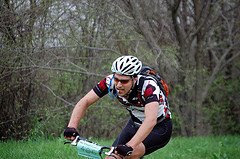 The MTB event was two laps of the classic LRT plus some grass and gravel levee action tossed in for good measure. The start on the levee allowed the group to space a bit and the fastest riders were on the single track first. The course was so fast that there was a huge train of riders, all going as fast as they could for the two laps. There were a few wrecks and a few flats, but for the most part everyone was really just cooking along on the perfect dirt trail. 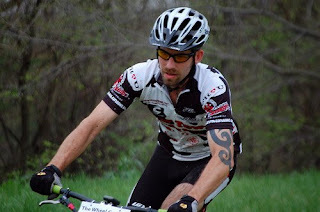 A few Cross bikes even showed to race and actually pulled through very well. It was a great day for racing and a great event! This was a great event. Thanks to all who helped make this event a success! The much anticipated God's Country events are this weekend. 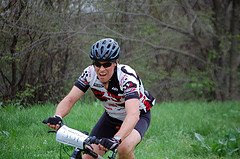 Come on out and enjoy a day of riding on those sweet Lawrence River Trails. Download a guide - God's Country Technical Guide. 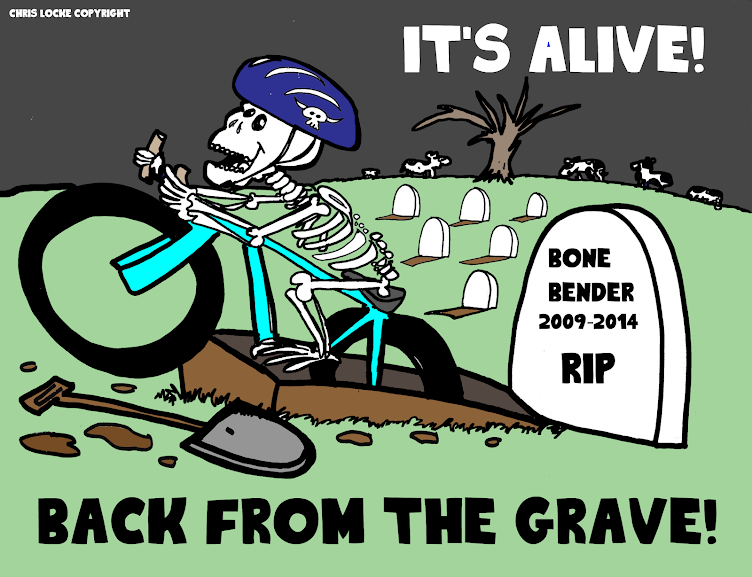 Cow Town Cycling Team had a heavy showing at the Bone Bender MTB Race over the weekend. Chris Locke and Co. with the help of Earthriders Mountain Bike Club, Midwest Mountain Bike Patrol and many other volunteers did an excellent job of getting this race set-up, prepped and executed for what was a first class event. Even though last minute the weather was not so, how you say...cooperative, but the race was on! As riders prepared for the race, the rain was pouring down. Everyone was preparing for the worst and hoping for the best. We all knew that there was potential for some suffering on the trails today, and that is exactly what we got. The course was excellent; a mix of mostly single track with few short sections of paved trail tossed in for good measure. The trails were in prime shape just hours before the race, but the rain had turned the flowing single track into either a wet, soupy mess or a clay mix that would cling to your bike in a way that would disable your forward progress in a matter of seconds. Many riders barely finished one lap and less finished the race at all. 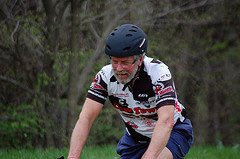 I know that at times I would have to stop and scrape the mud off my bike only to have to do it again fifty-yards later. Even trying to carry your bike with the additional weight of the mud was just pure torture. A true test of determination and will power. It was actually nice to hit the pavement for a minute here and there to recover, not just physically but mentally. I believe the course was estimated at 55-75 minute lap times, but with the conditions, even the fastest lap was a mere 72 minutes (and he was f a s t! ), with most first lap times coming in at 2+ hours! All riders coming into the finish area were covered in mud and had the look of death in their eyes. This was a hard race to finish, congrats to all of those who did! This photo of Chris really sums it up...all you could do was laugh! I believe a good amount of cash was donated to the Earth Riders Trails Association, as all proceeds from the event went in that direction. Thanks to all of the volunteers and the event staff for putting on a great event. The weather was not great, but that's racing! Cow Town Cycling Team had a large contingent down at the OC. 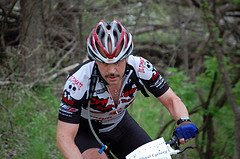 Some great finishes including a podium spot for John Wagner in the Single Speed and an 8th place finish for Mark Cole in the 80 Mile race. Randy Cartwright - DNF at Big Brushy w/broken rim. Congrats to everyone who finished this challenging event. Some pictures that Carolynn took. Here is some video action . Selby Holler continued his winning ways in the S.E.R.C. series in Bryson City, North Carolina. 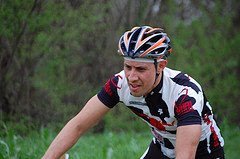 This event was very competitive as it was a combined event with the AMBC series and the Southern Classic Mountain Bike Series . Even with stiff competition Selby worked his way up from a poor start to stand atop the podium. 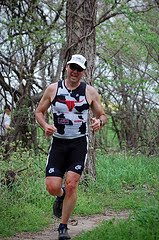 "On the Tsali trails you could hear racers in my division yell out were is the 'Cow Man'. Luckly their efforts to catch me came up short and I am very happy to get a hat trick".